Arraystar integrated RNA Sequencing for mRNA provides the full service from RNA samples, library construction, sequencing runs, to comprehensive data analysis. • Perfected and optimized sample prep, library construction and RNA-seq procedures. • High efficiency, high quality, cost-effective, unbiased library construction. • dUTP chemistry to ensure extreme transcript strand-specificity. • Ultra-high sequencing data quality to maximize the mappable reads. 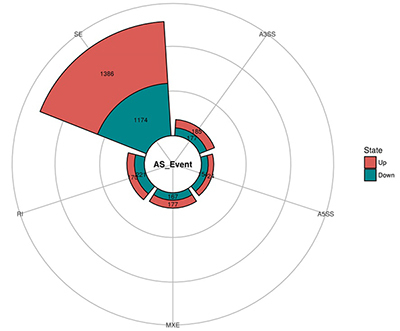 • Standard analysis package includes advanced in-depth analyses that go beyond the “standard”: Novel gene/transcript discovery, Gene Set Enrichment Analysis (GSEA) for functional prediction, alternative splicing events, and more. For high integrity intact RNA samples, the service includes poly(A) selection to purify the mRNA in the standard procedure. For degraded RNA samples, the alternative rRNA depletion procedure to remove the highly abundant rRNAs from sequencing is required separately. • Raw read data with read quality filtering. • Gene ontology and pathway analyses to explore the differentially expressed genes participating in particular biological functions or pathways. • Gene Set Enrichment Analysis (GSEA) analyzes the genes in functional sets that tend to show expressional changes, even if their individual differential expression may not appear strong or significant. Fig 1. 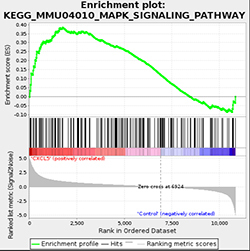 GSEA Enrichment Plot of MAPK signaling pathway. • Alternative Splicing Event Detection identifies and discovers novel splice isoforms using junction sequence information with the pair-end reads and deep coverage. 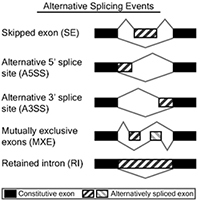 Different types of splicing events such as exon skipping, alternative splice sites and retained introns are detected and profiled for altered RNA processing. Fig 2. Alternative Splicing events classification. Fig 3. Alternative Splicing summary plot.